Onwards and upwards to Mickey's update. He arrived with really contracted heels and a weak frog, as is common with horses diagnosed, as he was with navicular bone and DDFT damage. Although the angle of the lower photo is not a perfect comparison you can see that his heels are already more supportive; he is no longer landing toe first. Clearly his feet still have a long way to go before the strength in the back of his foot is restored but he is making good progress with a stronger frog and digital cushion. Improvements still required but a less pinched and contracted foot today (below). Mickey still has under-run heels on this foot particularly - it is his worse foot - but he is slowly building a stronger foot. The shorter toe and more supportive heel are encouraging signs for the future. Heels gradually opening up as the back of his foot rebuilds. The lower, stronger heels are clear in these comparison shots - no trimming was required to make these changes. Getting on with the updates, these are Vico's 8 week comparison photos. The new hoof capsule growing in is at a better angle and will lead to a shorter toe and more supportive heel. Hos frogs have also developed now that he is landing heel first - this is his better foot and it has made faster progress than his left foot. We are also looking for better medio-lateral balance with Vico's feet, and he seems to be rebalancing his feet quite nicely. The changes to this foot have happened more slowly, in part because he has taken longer to land well on this foot and its still his weaker side. Nevertheless he is slowly developing a more supportive hoof capsule on this side as well. This is Chiprola's 4 week update - there are changes in her feet but they are largely a response to the change in environment she has experienced in moving from Dubai to here. When she lived mostly on soft sand she needed extreme concavity in her feet and her frogs did not need to be particularly robust as they received stimulus despite being well below the level of her heels. Now, living on surfaces which are still conformable but include harder ground as well, her frogs are starting to work harder and her heels are lower. Although the changes are more difficult to see from the outside once you pick the foot up and compare the frogs the changes in loading are clear. As usual, she has not been trimmed and has been allowed to rebalance her feet on her own and in her own time. The track system here and the fact that she is turned out in the fields overnight has also meant that she is probably moving considerably further over a normal 24 hour period than she was previously, which will also be contributing to the changes in her feet. ...starting with Maysie. Hard to believe that 4 of the current rehab horses have already been here 8 weeks and so it will be a busy few days for updates. As usual the original photos are at the top and the lower ones are the most recent. Maysie was quite slow to begin landing heel first but has definitely now got the hang of it and her palmar hoof is improving as a result. Her foot is no longer collapsing and is less under-run. This was the foot which had the worse medio-lateral balance and that is better now as well. The medial support you can see in the lower photo is helpful to her for now as its stabilised the hoof capsule so it no longer tips medially on landing. The digital cushion is better developed now, as you can see, but there is still a central sulcus split which needs to heal up. Her better landing should help achieve this. You can see that she has a stronger hoof capsule growing in from the change in angle at the top of the dorsal hoof wall. Her palmar hoof is stronger but this was her stronger foot in any case so the changes are less dramatic. On this foot she has a clearly healthier frog and her heels are stronger and less under-run. The foot is also looking better balanced and is loading more evenly. Finally a better developed digital cushion and a foot which is steadily becoming stronger, which is great to see. A quick update on Cassie who arrived 2 weeks ago. Her feet have a lot of change needed but she is taking steps in the right direction. There is already a distinct angle change which you can see at the top of her hoof and which shows how her new hoof capsule will grow in. This will result in a shorter toe but it will take time. Not a lot to show from the sole view - the long hoof wall is slowly chipping off and wearing down but for now its a rather ugly foot. 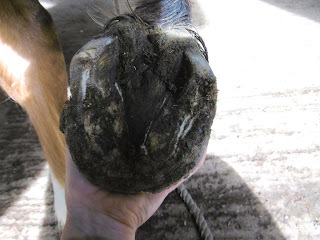 She needs to strengthen the palmar hoof before the toe shortens which is why I have not trimmed her feet. Her foot balance also needs to improve as you can see from the caudal shot. Again this will be a slow process but the foot is slowly stabilising. Cassie had just had an abscess on this foot when she arrived and developed an allergy to vetrap which is why she has a scabbed patch in the lower photo, but its healing nicely. Again, there is an angle change in the dorsal wall and a slightly better palmar hoof structure but its early days. Given another few weeks her long hoof wall will mostly be gone and the palmar hoof should be a lot stronger. There will be another update on Cassie soon, with hopefully more good changes.